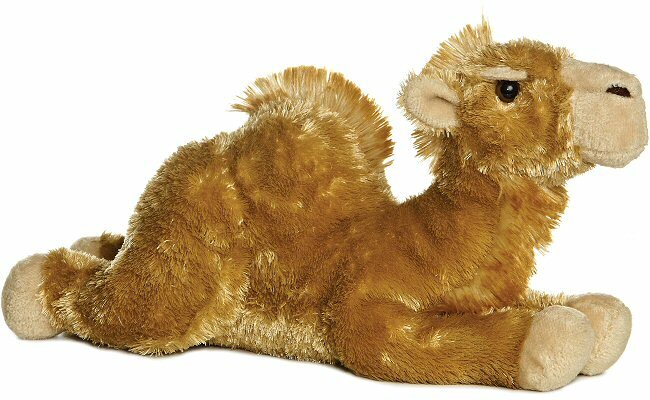 Arabian (Dromedary) Camel: Dromedary camels are perfectly suited for desert life. They can drink up to 50 gallons of water at a time and handle extreme temperatures. These large hoofed grazers store fat in their humps. These humps give camels their legendary ability to travel up to 100 desert miles without water. When camels have trouble finding food and water, they live off this fat in their humps. Dromedary Camels are very large. They can grow up to 7 feet tall at the hump and weigh up to 1,600 pounds. They have one hump and a yellowish to golden brown coat of wooly fur. They have double rows of eye brows and lashes and can close their nostrils to keep out sand. All camels have wide, two-toed hooves to help them walk on shifting sand. Today, nearly all of the world's camels are domestic animals. They are found in northern Africa and southwestern Asia, and have been introduced to Australia. Lifepsan is up to 50 years. This sweet Webkinz plush porcupine has amazing shimmery spines and a fun shock of white hair.